Elon Musk was clearly not joking when he said he was so tired of Los Angeles traffic that he was going to buy a tunneling machine "and just start digging." The billionaire entrepreneur now has a tunnel-boring machine that is tearing through the earth under a plot of land that his rocket company, SpaceX, owns in the LA suburb of Hawthorne. Musk even tweeted last month that an elevator -- which will allow cars to access the tunnel -- should be "up and running" shortly. But the project is still in its infancy. The Los Angeles city government told CNNMoney that the company doesn't have any permits to dig under city property. The odds of The Boring Company making significant progress anytime soon are slim to none. And Musk himself admitted its success is a longshot. Even so, Musk has a history of trying to bring the impossible to life. Here's where things stand. The idea for this company was first presented to the world when Musk got caught in one of LA's notorious traffic jams in December 2016. That same day he declared, "It shall be called The Boring Company" -- queuing up an endless stream of puns, many of which come from Musk himself. Musk loves snazzy names. Consider the seaborne platforms that SpaceX uses to land rockets on, which Musk named "Of Course I Still Love You" and "Just Read the Instructions" after spaceships in a sci-fi series. Naturally, his boring machine was bestowed with its own tongue-in-cheek name. It's called Godot, after "Waiting for Godot," a play that consists entirely of two men waiting for someone who never shows up. When Godot the machine had completed its first tunnel segment on June 28, Musk declared simply, "No longer waiting for Godot." Digging tunnels is a slow and cumbersome business. Musk said during a TED talk in April that a snail is "capable of going 14 times faster than a tunnel-boring machine." So, for inspiration, The Boring Company has a pet snail, named Gary after a character in SpongeBob Squarepants. "We want to beat Gary," Musk said. Second, he wants to ramp up the machine's power. Musk says current tunneling machines "are far from being at their power or thermal limits." How the company plans to achieve this is unclear. A spokesperson for the project declined to comment beyond what Musk has said on social media. We do know Godot isn't anything special. It's just your average tunneling machine that Musk says was purchased "second hand." That's how fast Musk says cars will be able to travel through his tunnels once they're constructed. "You should be able to get from, say, Westwood to LAX in five, six minutes," Musk has said. A Google maps search will tell you that trip usually takes about 40 minutes by car and warns of "heavy traffic" along the route. 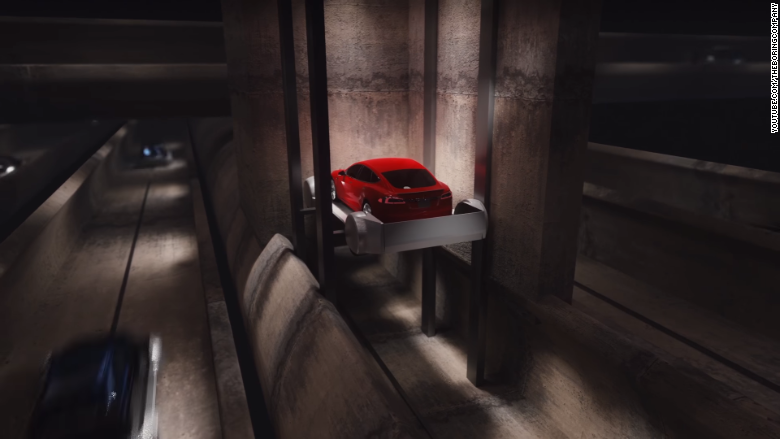 According to a concept video The Boring Company released in April, cars will enter the tunnels on elevators next to curbs or in parking lots. Then, they'll be whisked to their destinations on electric skates. In May, Musk posted a video of a test run of those skates. Musk's tunneling ambitions also tie in closely with one of his other long shot ideas -- the Hyperloop. The Hyperloop is a concept for a high-speed rail that travels through a vacuum-sealed tube and uses magnets to whisk passengers between cities in minutes. This concept would require underground tunnels as well. "If you build a tunnel that is good enough to resist [ground water], it is automatically capable of holding vacuum," Musk said in April. Musk believes the future of transportation is with tunnels and autonomous electric cars, not mass transit systems. He said in April that riding in emissions-free and autonomous cars will eventually "cost less than a bus ticket." If that proves true, it would mean more and more cars clogging up roadways. Musk argues that tunnels are a superior solution to that problem. 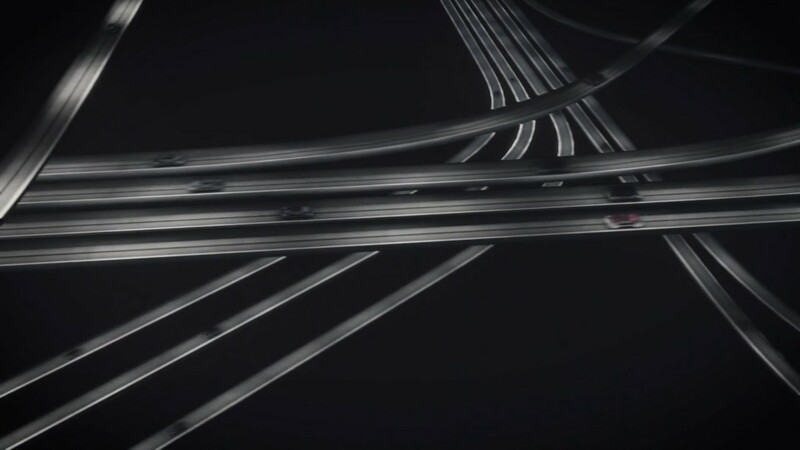 A Boring Company concept video shows a vast network of tunnels shuttling cars in every direction. "You can go much further deep than you can go up. The deepest mines are much deeper than the tallest buildings are tall, so you can alleviate any arbitrary level of urban congestion with a 3D tunnel network," Musk has said. And Musk says not to worry about the digging process disrupting people above ground. He says he plans to dig deep enough that you won't be able to detect the boring process. Saying Musk has a full plate is an understatement. He founded Tesla (TSLA), the transformative electric carmaker that's currently rolling out its first mass-market sedan. Musk also has plenty going on with SpaceX, which plans to test fly its enormous Falcon Heavy rocket, send a massive military satellite to space, and put a rover on the moon -- all before 2018. Not to mention all the other projects with Musk's fingerprints, like Hyperloop, solar roofs, Neuralink and utility-grade batteries. So how much time can Musk afford to dedicate to his tunneling hobby? "It's maybe 2% or 3%" of my time, Musk said in April. "This is basically interns and people doing it part time."